Not only do we offer modern and sophisticated invitations, we make it easy to create the exact invitation you want! We offer so many unique options to make your invitation your own. From changing colors to the invitation shape, each invitation will reflect your own fabulous style. We invite you to browse our customization options to see all of the possibilities! Using a tablet? Please turn it sideways for the best experience. Your favorite colors are ours, too! All text and most background images can be changed to the colors you select at no extra charge. 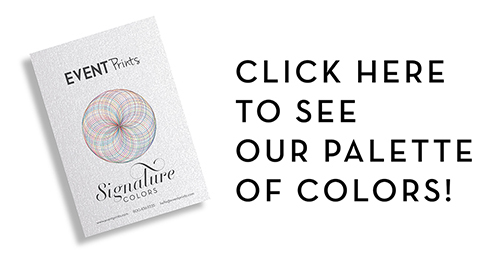 Download our color guide to see our popular color options. We can also match a Pantone color if you have one in mind. By customizing your invitation colors, your invitation will truly become a cherished original! We show most invitations in a square shape. but we're happy to convert any design from a square to rectangle shape, either portrait (tall) or landscape (wide) orientation. Just let us know when ordering your invitation and we'll design your proofs in the shape you prefer. 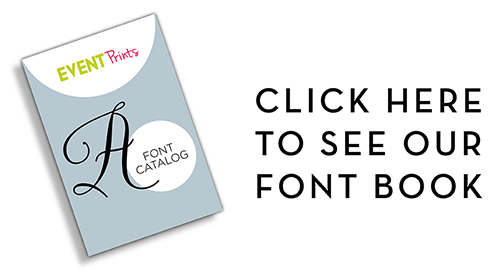 Each invitation at EventPrints includes popular wording. If you'd like something different, feel free to customize your invitations with whatever verses and wording you'd like to use. Changing text is a free option. Need some ideas? You may browse our other invitations for inspiration, or check out several other ideas on our Wording Options page. Pick one or combine a few to come up with the perfect phrases that express your sentiments. Then, when completing your invitation customization, let us know the verse number, or copy and paste the wording into the customization box. When it comes to the paper we use for your invitation, we tend to be pretty picky. After all, paper is the foundation of a great invitation. We've sourced the finest papers from the most prestigious paper mills, and selected the very best for you. But then we did something a little crazy. We decided to give away our best papers at no extra cost. We'll include a paper swatch book with your invitation samples, or email us for your free copy. All thank you notes are printed on uncoated stock for easier writing. Want a different font for your invitation? We can help with that! We offer the option to change the large font used for your name at no extra charge! Browse our other invitations to find one you like or download our font book on the left to see even more. If you'd like to change the font used in the body of the invitation or on other items, such as the Reply Card, this is a bit more involved, so we offer this option for a small charge. You love the backside design of one invitation, but prefer the layout of another suite. Not to worry! At EventPrints, you can mix the front and back sides of two different invitations at no extra cost. We'll even match the colors so they are perfectly coordinated. The result is a one of a kind invitation that perfectly matches your exquisite style. It's easy to do. Just select the front side and back sides you like and our professional design team will handle the rest! Add a Hebrew name to any of our invitations. Choose from 12 different Hebrew fonts! Take your invitation to the next level with our Custom Backers. Our backers double the thickness of your invitation and add an extra degree of sophistication. We offer two options for backer cards. Our exclusive Printed Backer features a solid color on the side facing your invitation, and the invitation design on the back side of the card. It's the best of both worlds! You may also choose a solid color on both sides, matched to one of your invitation colors. Who doesn't love the look of elegant foil printing? But until now, the cost of adding foil to an invitation was cost prohibitive for many. EventPrints is proud to introduce our new foil printing at prices that may surprise you! We'll print your name and event type in stunning foil for prices starting at $150. That's less than a third what other invitation companies typically charge! Even better, we can add foil for orders as small as 75 pieces. Learn more about our Foil Printing. Don't let anyone call you a square! Add our eye catching corner die cutting and take your invitation to a new level of fabulous! Adding a corner die cut is a very affordable $19 which covers all of the invitations in your order. Or, add the same corner treatment to other items in your order, such as the Party Card, Reply Card or Weekend Card for an extra $10 per item. Please note, adding a printed backer with elegant or notched corners adds 50 cents per piece and 2 additional production days.